I suppose handling rejection is something we all have to deal with at different points in our lives. Maybe your fumbled advances to the prom queen (or Football Jock: this is a non-sexist blog), were greeted with those immortal words “Bug off Four Eyes”. Maybe the girl that you knelt before, ring in hand, gave you the cold shoulder or the job interview for a position you just knew suited your skill set perfectly unfortunately still left you back on the street cap in hand. Truth is rejection is a fact of life and it turns out that hiking for a few hours and camping rough under the stars in an effort to escape many of the trials and excesses of urban living still won’t protect one from being given the bird, the trout are more than happy to let you know that you don’t have all the answers and need to be put in your place. 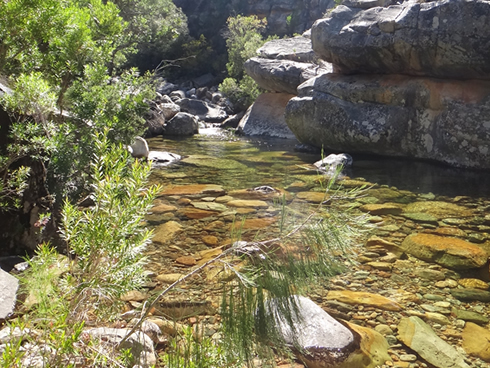 A case in point this past weekend when myself and a few friends fished high up on the Jan Du Toit’s river, a spectacular piece of the countryside, dominated by an arduous hike, rough camping on the side of the steam, clear water, steep cliffs and of course trout. 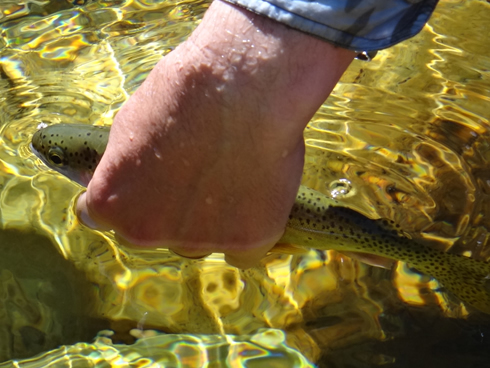 As is often the case, trout found in moving water aren’t that difficult to fool, even clear moving water. They have the disadvantage of limited time to make a decision and a slightly wayward view of things through the agitated surface. The really tough ones are those who are in the flat calm. Flat and Crystal Clear, you can expect some refusals from smart trout. On this specific stream it seems that many of the fish have a particular behaviour pattern of holding for a while in the moving water at the head of a pool before taking a leisurely swim around the confines of their naturally formed impoundments. The structure of the stream, which is notably steep, seems to produce pools which shelve off into shallow water just prior to dropping into the next run. Where some rivers have deep water at the back of the pools on this stream slow moving shallows are the norm and the fish seem to have adapted to that. In addition one suspects that the food chain isn’t that strong and that terrestrials feature quite heavily on the menu of the trout. So it is well recognised that the fish will go “walkabout” into the quietest and shallowest back ends of the runs every so often, even with dorsal fins out of the water, just to check if there is anything worth eating stuck in the surface film. It is a behaviour that the angler can use to his or her advantage. Where in such water a cast at a fish would almost surely result in one’s piscatorial quarry taking flight, here, if you are smart and can hold your nerve, you can put out the fly and wait for an interception. 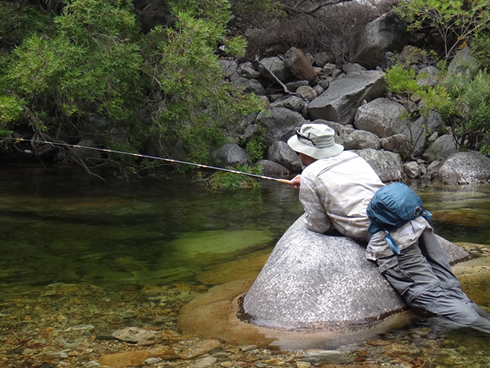 Despite some sneaky rock hiding, Craig’s Tenkara just wasn’t up to the challenge of the flatter sections. Having reached one particular pool; and one must add that previous experience suggested that playing the waiting game here could be to one’s benefit, we held back and watched. The clock ticked and time passed and then a cruiser appeared. These fish are remarkably well camouflaged and not easy to see, such that they seem to just appear and disappear at will, not unlike those infernally frustrating 3D images which only reveal their proper nature to the truly attentive. So the fish appears, following a defined and lazy circuit of the pool at which point I lob out a small dry, an elk hair caddis I believe, on 7X tippet and a 20’ leader a good way ahead of the trout. 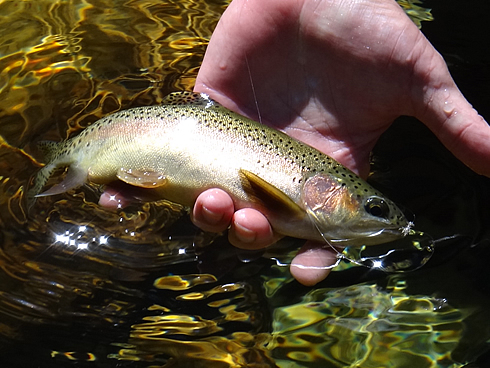 The fish approaches and spots the fly, speeds up slightly until directly under the Judas caddis pattern, halts directly under it and touches it with his nose before turning away. Just as well we were a long way from the nearest betting office because I would have put serious money on the fact that the fish was going to eat that fly. We managed some success, even on fish bigger than this, but not every time. We wait and there appears another fish and this time I put out a flying ant pattern, a sure fire winner under such tricky conditions, again the apparently committed inspection followed by an up close, and in this case very personal, rejection of the fly. Twice in two casts, very good casts I might add, I thought that I was on the top of my game but it wasn’t enough to fool those fish. Unlike being given the boot by the prom queen or the potential paramour however I actually laughed at the fish, they were in their environment doing what they do and the truth be told that no matter how good I thought the presentation and the imitation it wasn’t good enough. Good luck to the fish, it is what motivates me to head up the mountains in the first place. Mind you, no matter that I failed, I managed to take the rejections in my stride, but there is still some satisfaction in seeking retribution. So I re-rigged with an even longer leader down to 8x this time, left the flying ant pattern on (trout can sometimes be persuaded to lose their heads a bit when it comes to ants), and tried on a third cruising fish. As he swam down the pool he picked up a real morsel in the film and perhaps confidence boosted by that minor success approached the ant. The same approach, the same apparently casual inspection, the same frozen moment directly under the fly and then the take. Bingo, after a brief fight he was netted and released, and I felt a little better that I had fooled one fish. He was the smallest of the trio, and one assumes therefore the more impetuous of the crew but I didn’t feel quite so bad about missing out on the others. Clear Water: The secret lies in the presentation, and it has to be perfect. On a technical note, perhaps the slightly finer tippet helped, maybe that the fish having eaten something real not moments before making an error did have an effect, maybe the mildly longer delay before the trout arrived gave the tippet a little more time to settle and sink a tad into the film. For that matter maybe like the egotistical and self- important prom queen, when rejected you can always ask the slightly less attractive side kick for a dance, and this slightly smaller and perhaps less wise trout really amounted to not much more than second best. It didn’t really matter that much, fly fishing isn’t a matter of life and death (and yes I am well aware of the quote that suggests “it is much more important than that). But it was a really fun excursion, a good bit of exercise, pleasant company, fantastic scenery and some fly fishing education thrown in. The trout won some rounds and we won others, nobody was hurt and we returned home with fond memories, a bit of sunburn, tired legs and backs and all too soon we will be thinking on those trout once more and trying to get a spot to head back out there. The scenery makes up for any sense of failure. One thing for sure though, I am convinced that the tippet is the culprit most of the time (see: The Fishing Gene: Should Tippets Float). Arguments about whether it should sink or not fall on deaf ears around here. It should sink and anyone trying to prove otherwise is welcome to hike up a mountain with me, camp overnight on the river bank, and climb up to a crystal clear and frighteningly still pool to try to intercept cruising fish under a blazing African sun, where the shadows of a falling human hair scare the neighbours and you know that if you make a mistake your next trip will only come around again in a year’s time if you are lucky. 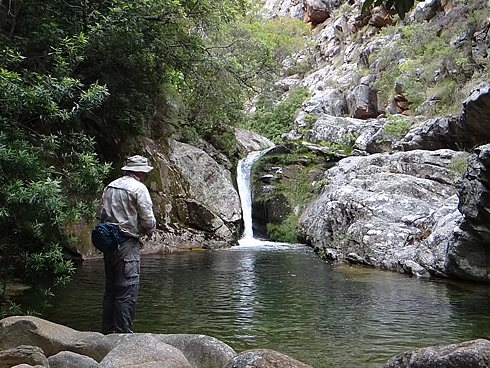 Editor: This river is under the control of Cape Nature, access is strictly limited, a permit is required and catch and release fishing with barbless hooks is mandatory. Unauthorised entry, fires and killing fish are illegal, in addition the nature of the terrain, difficult hiking and high access traverses make the river potentially dangerous for the inexperienced. Parties with permits should insure an experienced hiker who knows the river is included in the group. Access permits can only be obtained by lucky draw available to members of the Cape Piscatorial Society. This entry was posted on January 19, 2014 at 10:17 pm and is filed under Cape Streams, Fishing, Uncategorized. You can follow any responses to this entry through the RSS 2.0 feed. You can leave a response, or trackback from your own site. 150 posts. I wonder what that equates to in number of words. Congrats on the achievement both piscatrially and edtorially. Looking forward to the next 150. Great article, very interesting! Wish I was there. As always, a lovely article backed up by amazing photography.